Detroit is home to the MGM Grand, Greektown, and Motor City Casinos and Hotels. 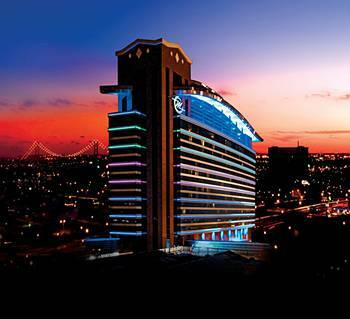 Across the river in Windsor, you'll find Caesars Windsor, another great casino and hotel. Between the four, you can spend days gambling, seeing shows, enjoying spas and restaurants, and relaxing in the modern and upscale hotel rooms. Who needs Las Vegas when you have Detroit? Along with the great entertainment options inside each casino, several nightlife options surround each casino, as well. Check out the hotspots downtown, see a game at nearby Ford Field, Comerica Park, and Joe Louis Arena, or grab a delicious bite to eat. You'll never run out of things to do when you are in Downtown Detroit! With all of the amazing hotels, spas, and concert venues that come with casinos, you'll find that it's easier than ever to have a night out at a casino! A casino tour is a great idea for a fun filled adventure, as you can enjoy all of the best places for gambling in Detroit, all in one night. With professional transportation, this is easy for anybody to accomplish. When you decide to rent a limousine or party bus for your casino hopping, you can enjoy all of the finer luxuries of life without a second thought. You and your friends will be as comfortable as ever as you share laughs and drinks in Downtown Detroit. There won't be any worries of finding a designed driver or dealing with parking, leaving you to have the maximum amount of fun.